Страницы научного блога Блудова А.А. The invention relates to music keyboard design. The music keyboard consists of keys which are organized in the form of a two-dimensional matrix and are ranged along one axis of the matrix as an arithmetic progression of the frequency of the sound produced and along the other axis of the matrix as an arithmetic progression of the period of the sound produced. The technical result is an improvement in the quality of the sound of the musical instrument through the elimination of acoustic interference, and greater ease of use of the major and minor scales. a) Field of the invention. The invention relates to music keyboard design. An analogue of described invention is the e-key for keyboard synthesizer. The synthesizer is an electronic musical instrument that generates (synthesizes) sound through one or more generators of the sound waves. The desired sound is achieved by changing the properties of an electric signal (analog synthesizers) or by the CPU settings (digital synthesizers). Synthesizer, made in the form of a system-block with a keyboard, called the keyboard synthesizer. Synthesizer as a system-block without a keyboard called a synthesizer module and it controlled by MIDI-keyboard or other device for sound control, for example, MIDI-guitar. If the keyboard has a built in sequencer, synthesizer is called a workstation. Synthesizer as a computer program using a universal sound card and standard input-output devices (computer keyboard, mouse, monitor, headphones), is called software synthesizer. The prototype of the invention is MIDI-keyboard for synthesizer module because synthesizer module allows with software and hardware generates any pitch of tone. Also synthesizer module can be connected to standard or modified keyboard. Analogue and prototype are a software-hardware direction for development of musical instruments that gives them maximum flexibility to customize the pitch, tone, and other characteristics of the sound in frame of single musical instrument. However, the keyboard for the analogue and the prototype are designed as a one-dimensional structure. 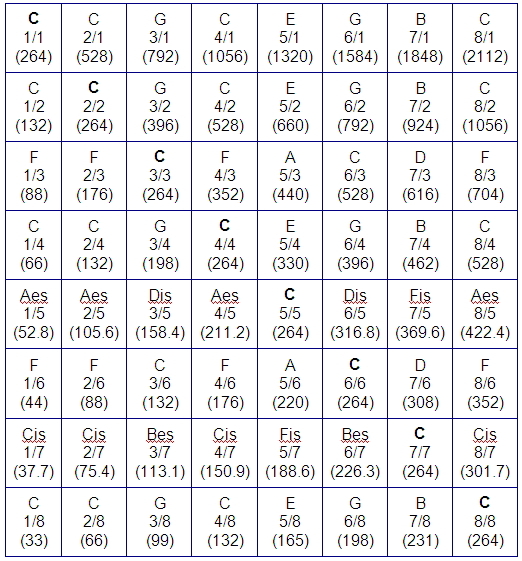 As is well known, 12- tone equal-tempered music scale is a geometric progression. 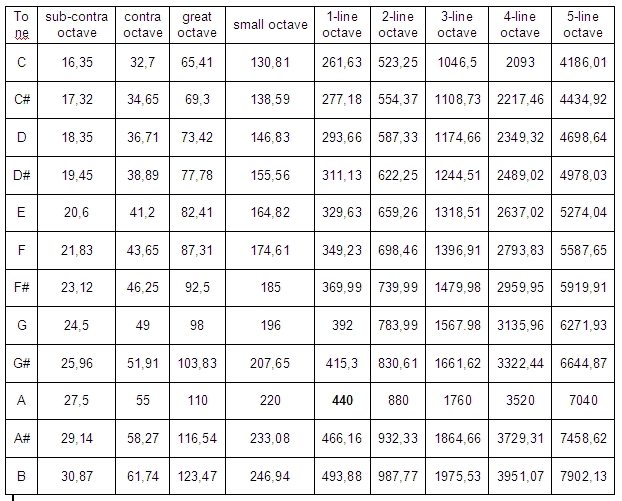 Table 1 shows the frequencies of 12-tones equal-tempered music scale, tuned to standard tuning fork (A 440 Hz). Natural scale (from Lat. Natura - nature) or overtone scale is a series of tones, consisting of the fundamental tone and harmonic overtones. The harmonic series is an arithmetic progression (1xf, 2xf, 3xf, 4xf, 5xf, ...). In terms of frequency (measured in cycles per second, or hertz (Hz) where f is the fundamental frequency), the difference between consecutive harmonics is constant and equal to the fundamental frequency. Natural scale corresponds to the spectrum of complex harmonic oscillator - natural sound source (eg, a string or column of air in the tube). 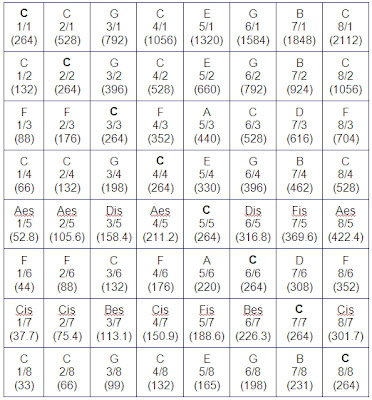 The table 2 shows that only octave is natural interval in the equal-tuning scale. The difference between natural and equal-tempered intervals is the reason for the decrease of quality musical instruments with equal-tempered tuning, due to the appearance of acoustic interference. Also, when playing major or minor tonalities, there is a need to skip certain keys that do not fall into the tonalities. The above-mentioned disadvantages, namely: absence of natural intervals (except the octave) and a mixed arrangement of keys for major and minor tonalities are "payment" for the design of the keyboard as a one-dimensional structure. it is proposed the design of the keyboard as a two-dimensional structure. The matrix of this keyboard is presented in Figure 2. 1. For horizontal or vertical movement between adjacent keys or playing a chord the dissonant intervals and acoustic interference do not appear, because the matrix is based on natural musical intervals. 2. The intermittent keys location for major and minor musical scales eliminated. 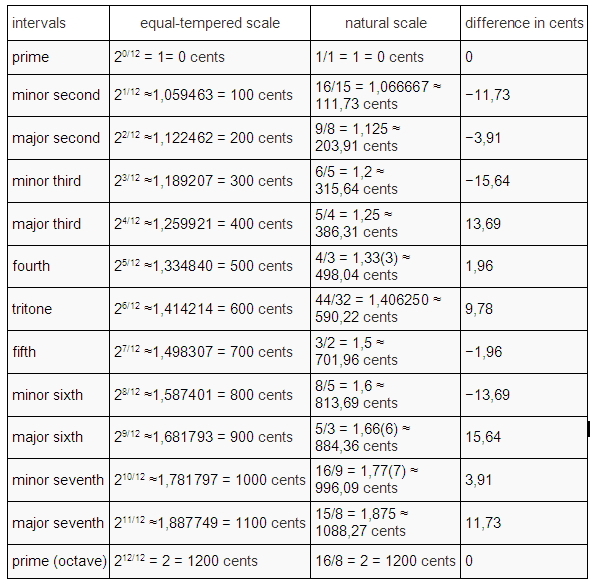 Major and minor musical scales are perpendicular. In the example, a major chord are arranged horizontally (c, e, g - 4 line from the top), minor - vertical (c, d-sharp, g - 6 column). 2. 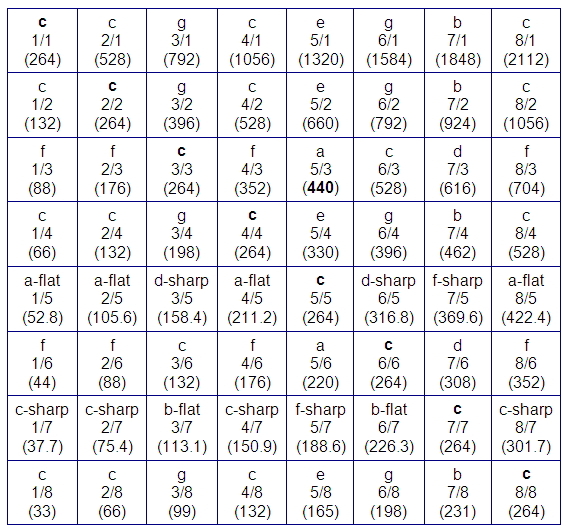 The matrix contains all 12 chromatic intervals (Figure 5). 4. 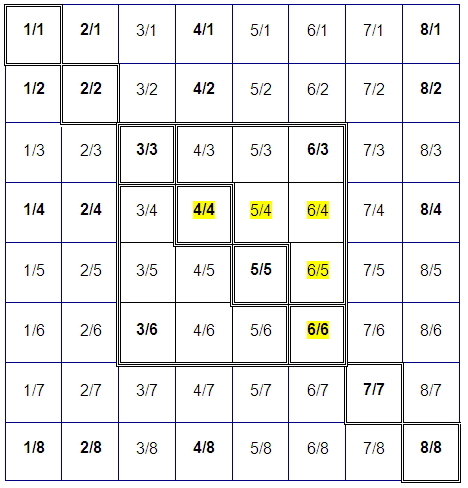 The range of the matrix (8x8) is 6 octaves and it can be shifted at least to one octave. In the example, the range of the matrix is from “contra-octave” to the beginning of “4-line octave”. 5) The changing of tonic (keynote) pitch requires reconfiguring the matrix. 1. 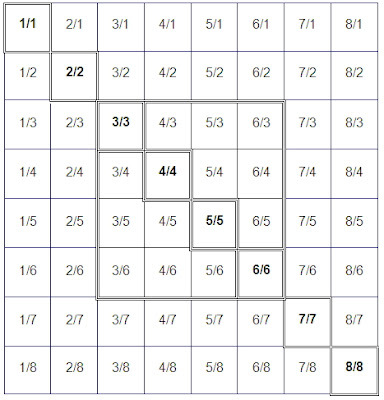 The “natural minor” is a scale built like a vertical arithmetic progression of all periods of the matrix’s top row. The arithmetical ratios are these periods. 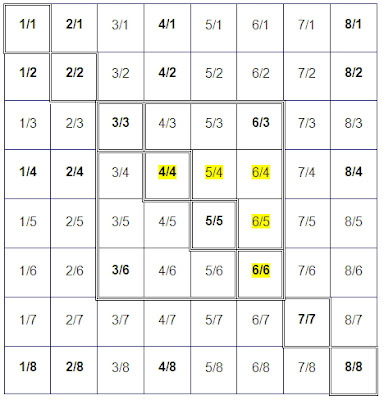 In turn, this matrix’s top row is an arithmetic progression of the tonic frequency . The 6, 5, 4 members of the “minor progression” form a minor chord (see figure 2 and figure 5). 2. The “natural major” is a scale built like a horizontal arithmetic progression of all frequences of the matrix’s left column. The arithmetical ratios are these frequences. In turn, this matrix’s left column is an arithmetic progression of the tonic period. The 4, 5, 6 members of the “major progression” form a major chord. (see figure 2 and figure 5). Matrix keyboard design for musical instruments keeps its advantages and features of the case turns on its axis. b) a method for producing of musical intervals are ranged like in the described matrix. Figure 4. Keyboard design with selected tonic (keynote). It is known audio control device - keyboard for musical instruments, in particular, the keyboard for synthesizer. Technically easy to change the design of the keyboard and transform it into a matrix. In particular, the design of the keyboard, in the simplest case, may look like shown in Figure 3 or Figure 4. Since the keyboard is a sound control device, for example, for synthesizer module that is selected like the prototype, there are standard hardware and software tools to perform basic operations on matrices. 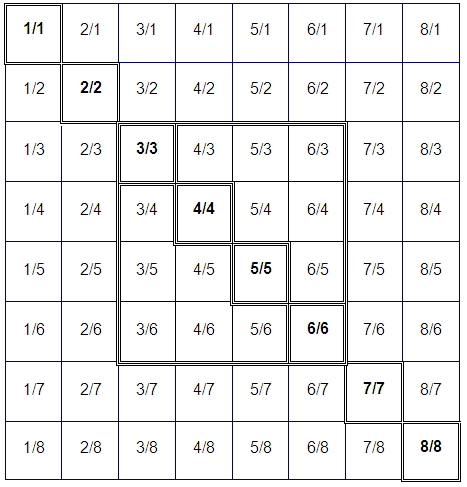 In this case, it is the multiplication matrix to number. These operations will expand the functionality of a musical instrument and arbitrarily set the value of the tonic. The using of this keyboard is more convenient than a standard keyboard for piano or synthesizer. To simplify the perception of musical intervals should mark out all tonics, the diagonal of the tonic and major-minor chords as in Figure 3 and 4. 1. The music keyboard, comprising keys which are ranged by the frequency of the sound produced, characterized in that the music keyboard keys are organized in the form of a two-dimensional matrix and are ranged along one axis of the matrix as an arithmetic progression of the frequency of the sound produced and along the other axis of the matrix as an arithmetic progression of the period of the sound produced. 2. A method according to claim 1 characterized in that the musical intervals are ranged like in described matrix (2). The relationship of the periods of the sound produced by the keys represented by the arithmetic progression on the vertical axis. Since the period of sound oscillations is a value inverse to the frequency the matrix can be presented differently. The relationship of the frequencies of the sound produced by the keys represented by the arithmetic progression on the horizontal axis. Продается патент: "Клавиатура музыкального инструмента в форме двумерной матрицы."